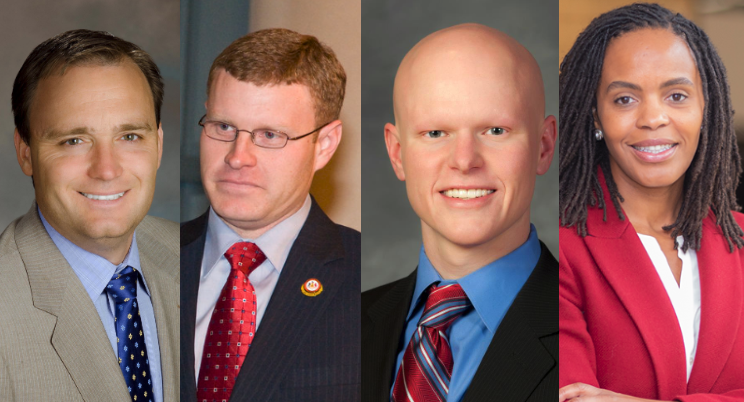 From left to right: Candidates Tim Chapman, Jeff McKay, Ryan McElveen, and Alicia Plerhoples. Jeff McKay, Tim Chapman, Ryan McElveen, and Alicia Plerhoples are all running for Chairman of the Fairfax Board of Supervisors. They've told us what they think about important issues on affordable housing, development, road safety, and transit in Fairfax County. Tell us what you think about their answers. Greater Greater Washington's Elections Committee posed a questionnaire to candidates in Northern Virginia primary elections for General Assembly, Fairfax County Board of Supervisors, and Arlington/Falls Church Commonwealth's Attorney. Across 10 races, 32 of 36 candidates returned our questionnaire. Here are the responses for Chairman, in the order they submitted the survey. We'll be posting other races soon. The primary is June 11. Q: Who do you think has the hardest time finding housing that’s affordable to them in Fairfax County, and what steps do you plan to take to address that need? Jeff McKay: Finding affordable housing can be a challenge for everyone in our community, but it’s especially challenging for our extremely vulnerable population (such as those with disabilities and those battling homelessness) and immigrants who have just relocated to our area. As housing and rent costs continue to rise in Northern Virginia, we as a Board must do more to make housing affordable. As Chairman, I will prioritize both the creation and preservation of affordable housing through innovative land use decisions and in our County budget. We just received the most comprehensive set of both short- and long-term recommendations in decades from a group our Board established called the Affordable Housing Resources Panel. Among those recommendations are a call to produce a minimum of 5,000 new homes affordable to households earning up to 60 percent of AMI over the next 15 years, as well as calls to increase the “Penny for Affordable Housing Fund” by the equivalent of one additional cent on the real estate tax rate, use the current “half penny” for preservation projects, and ensure no net loss of “market affordable” rental apartments. A similar “no net loss” policy was recently adopted by another work group, formed by Supervisor Dan Storck and me, designed to protect existing affordable housing along the Route One Corridor as the landmark Embark Richmond Highway plan comes to fruition. The 5,000 new home number is a floor – and I believe we can and must do more. We have a high number of projects in the pipeline, an innovative ability to do land use, and increased efforts by our County to acquire land to build additional affordable housing. I am committed to working to create a housing market that works for all, as I have been doing in Lee District for more than a decade. Tim Chapman: My professional career has focused on building affordable housing for the Washington DC and Maryland areas. I have built my housing development firm solely on trying to solve the affordable housing crisis in the DC region. Fairfax county needs a Chairman who understands what it takes to make a meaningful impact on the housing rates. I support deed restricted units tied to the medium area income. This will help ensure the units intended for those families/individuals who are 30%-120% of the median area income, receive the benefits from affordable housing. We need to do a better job of making sure those individuals below the median area income level are able to find affordable housing. Ryan McElveen: Fairfax County’s affordable housing stock is nowhere near large enough to accommodate demand today, and the neglect of investments in this critical infrastructure by the Board of Supervisors over the past few years has set us back further as we look to the future. We must ensure that our elders, special needs populations and workforce—from our public school, local government, police and fire employees to our retail and service sector employees—have access to affordable housing spread throughout our entire community. At a time of County revitalization and regeneration, we need to recognize the linkages between affordable housing, education, healthcare, transportation, and climate change, and use these linkages to fuel the co-location of services in our community and build upon the community schools movement. Additionally, Fairfax County government needs to take an honest look at how its policies may be reinforcing and/or expanding the difficulties our residents of color face when trying to purchase homes, continue to afford to live in their homes, or rent. And we can always do better at ensuring Fairfax County does not allow the continued rise in housing values to adversely affect communities already under stress, such as undocumented residents. As Chairman, I will invest in increasing the county’s affordable housing stock to accommodate the 15,000 additional units that have been deemed necessary. There are creative ways to address the shortage by building on both publicly-owned land and the private property of churches and other civic institutions. Alicia Plerhoples: As a child, I experienced housing instability and food insecurity, just as many hardworking families do today in Fairfax County. My family was evicted from our home after my father was fired from his job for standing up for his students. I spent some of my fourth-grade year living in unconventional housing (hotel and motel rooms) with my family. I know first hand how difficult it may to find affordable housing across Fairfax County. Fairfax County’s working class and low-income residents often struggle to secure the proper housing resources needed to survive in today’s society. Affordable housing is also a middle-class issue – seniors cannot afford to age in place, millennials cannot afford to return to where they grew up, and wage earners cannot afford to live where they work. As Chairman of the Fairfax County Board of Supervisors, I will advocate for the development of affordable and workforce housing. Fairfax County will need to produce 15,000 units of housing affordable to households up to 60 percent of the area median income (AMI) over the next fifteen years. The Affordable Housing Resources Panel recommended that a minimum of 5,000 units of affordable housing be built over 15 years. While a step in the right direction, this recommendation is too modest in comparison to the need. I support fulfilling the full 15,000 units of affordable housing that is needed. The panel has recommended that an additional one penny, in addition to the existing half penny of the real estate tax allocated to housing, be dedicated to developing affordable housing (approximately $38 million). I support this recommendation. Fairfax County should have invested in affordable housing years ago when housing units were cheaper; we are now playing catch up but at higher costs. We also need to address the fact that 82% of our residential land is zoned for single family homes. This encourages unaffordability. I support an analysis of the areas in Fairfax County that can be rezoned for the inclusion of duplexes, triplexes, and other multi-family unit housing to increase the supply of affordable housing. Finally, we need to develop the county in a way that avoids gentrification and displacement of our most vulnerable populations. We need economic growth the benefits everyone in the county. For any revitalization efforts I will push for plans that result in no net loss of market affordable units. We must build affordable housing across the entire county so that we do not add to existing pockets of poverty. We also must hold developers’ feet to the fire to build affordable units for families and for residents who are not in the top affordable housing income brackets (we need affordable housing units for families at 30-60% of AMI). We also need elected officials who are willing to say “no” to campaign contributions from real estate developers so that they do not face any actual or perceived conflicts of interests with regards to development in Fairfax County. Q: Would you champion increasing housing diversity in parts of the county which have fewer lower-income residents than the entire county and Washington region as a whole? Why or why not? Jeff McKay: We must champion that. Affordable housing must exist near transit, near jobs, and throughout Fairfax County. It cannot and must not exist solely in one or two areas. I am proud to represent a district with among the most affordable units in the County, and I have always been frustrated that our affordable housing is not better distributed countywide. Our residents should have the opportunity to live in all parts of the County, not just a few. Tim Chapman: Yes, Fairfax county needs to focus more on building affordable housing. Developers are fixated on the larger developments, but the county should implement incentives for more affordable housing. Fairfax County should strive for 10% of the housing units be prioritized as affordable. This goal is the start Fairfax County needs to be more affordable for our teachers and others who cannot afford to live here while they work in our community. Ryan McElveen: I am the only candidate in this race who has experience as an elected official representing all Fairfax residents and overseeing 53% of the county budget as a School Board member. I am also an outsider to the Board of Supervisors. Over the past eight years, I’ve watched as decisions were made by the Board that frustrate me, just like any other Fairfax resident. The development patterns that have been promoted by past Boards of Supervisors have led to the stark divides between the “haves” and “have nots” in Fairfax County, with some supervisor districts having a much greater proportion of affordable housing than others. These kinds of development patterns have led to socio-economic “tipping points” in some of our schools and communities, which have in turn increased the strain on public services and community service organizations, which work harder and harder to overcome them. Enclaves created for the benefit of richer, and white, residents are at the core of much of Fairfax’s story. Many of us are unaware that Vienna, for example, has deep roots as a black community before being turned over to white government workers fleeing the city. We must dig further into how we got to where we are in order to figure out where we should be going as a county. This, of course, means that no one should feel like they live in a bubble. Every inch of our great county should be considered for the same opportunities to better serve all of our residents. Alicia Plerhoples: Yes. I believe that housing diversity is an essential driver of our economy. We must look at innovative ways to tackle this issue in every corner of Fairfax County. We must build affordable housing across the entire county so that we do not add to existing pockets of poverty. Clusters of poverty adversely impact our youth and our schools. Socio-economic diversity across the county will help all residents thrive and improve outcomes for all county residents. Q: How do you reconcile the need to provide housing affordability in the parts of Fairfax County with good transit with some other people’s stated desire to slow development? Jeff McKay: Fairfax County needs to do more to preserve and grow its affordable housing stock. On this item specifically, it’s important to note that Fairfax County has limited federal resources and many restrictions imposed by the state in terms of development, as Virginia is a very strong property rights state. Because of that, the County must work innovatively within its means to achieve our shared goals while always ensuring we get affordable housing with new development cases to complement our other housing resources. As mass transit expands and reliance on cars decreases (which I strongly support), the County must partner with builders, nonprofits, and other third parties to ensure not only the success of transit but also the protection of the community, affordable housing, the environment, and all other factors in play. All of these items go hand-in-hand and the success of one depends on the success of the others. The recent adoption of Embark Richmond Highway, which is discussed more in my next answer, highlights how the County can successfully partner good transit with smart growth, designed to enhance liveability, walkability, bicycling, environmental protection, and affordable housing. Tim Chapman: The Chairman of the Board of Supervisors needs recognize we have a problem with affordable housing and transit improvements. Once the Board of Supervisors acknowledges that we need to invest into more affordable housing units, then action can be taken. Getting people off the highways and into mass transit will be one of my top prioritizes when I become Chair of the Board. Ryan McElveen: The affordable housing shortage, along with our clogged roads, are two crises that are intricately intertwined. We have for too long built unsustainable, wasteful housing designed only to further isolate rather than bring communities together. We need denser development, but we also need that development to serve a broader range of our residents than what most developers envision when they pay lip service to this need. The more affordable housing we build near transit hubs, the more people we will have utilizing public transit and the fewer cars we will have traveling long distances on our roads during rush hour traffic. Since slow development advocates tend to be overly concerned with increased traffic on our roads, this is a way to combat this concern while also addressing the need for a diversity of housing options in our community. Alicia Plerhoples: In order to have an economy that truly works for everyone we must tackle both our transportation/transit and housing development issues together. Housing development has not kept pace with job growth in the county. People who work here cannot afford to live here. In addition to providing the necessary affordable and accessible housing in the county, we must also seek ways to connect transit options to these developments. Many hardworking residents of Fairfax County depend on public transit options to travel to work each day. Often good transit options are in areas where housing costs are high (around metro stations, for example). As Chairman, I will insist that developers commit to building affordable and workforce housing units for families near any new developments near good transit options. I will also push for the co-location of affordable housing at county facilities which are near good transit options. Housing diversity is an essential driver of our economy. Clusters of poverty adversely impact our youth and our schools. Socio-economic diversity across the county will help all residents thrive and improve outcomes for all county residents. Without a joint approach, our system will continue to fail many of our residents. Q: Fairfax County has been pushing for walkable, transit-accessible communities to meet demand and reduce greenhouse gas emissions from transportation. Would you continue this trend, and where in the county would you emphasize this? If not, why not? Jeff McKay: Creating walkable, transit-accessible communities is critical, now more than ever. I’m proud to have supported this goal for my 11+ years in office, working to rewrite comprehensive plans across the County to promote transit, walkability, increased bike lanes, and protection of our environment. Our recent adoption of Embark Richmond Highway is the poster child for that work. Following years of work with the community and various stakeholder groups, this sweeping plan amendment was adopted last year. In it are plans for an all-new environmentally-sustainable, walkable, bike-friendly area with a bus rapid transit system on Richmond Highway as part of more than $1 billion of public investment. These types of plans, whether along Route One, in Lincolnia, or in Tysons, are critical. For example, the County has prepared the plan for Tysons and the transit elements are falling in place, but walkability suffers immensely today. The other employment centers in the county would benefit from an approach that not only encourage mixed use development to support more walking/transit trips, but also look in the areas surrounding them to create opportunities for people to live/work/play closer so the trips they make not so long in distance first. Then we can improve the time it takes for people to travel. The current Counties transit planning process is complex and there any number of corridor based improvements and there should be some additional focus on access to transit and service levels serving centers. Transit should be targeted about both captive and discretionary riders. Another aspect of walkability is on our neighborhood streets, again are the streets for people or cars? Connecting neighborhoods to small shopping areas, schools, rec centers, parks are all part of the tools to encourage people to make trips by some other than a car. As much as building new project that a pedestrian and bicycle facilities, it is about filling the gaps in the existing network. Ryan McElveen: The transformation of our transportation infrastructure is going to define the future of Fairfax County. Expansion of our transit systems will be crucial—including the completion of Metro’s silver line, the extension of orange line to Western Fairfax and blue line to Southern Fairfax as well as the Embark plan for the Route 1 corridor. However, even with these transit extensions, there are going to be areas of the county that remain transit inaccessible. As we look for more permanent solutions, we will need to develop roads that safely accommodate electric and autonomous vehicles. Alicia Plerhoples: I am a strong proponent in the push for more walkable, transit-accessible communities that will reduce greenhouse gas emissions across the entire county and across the region. 97% of Fairfax County’s GHG emissions are from the private sector. We must get residents out of their cars as they travel to and from work. The Fairfax County Environmental Quality Advisory Council recommended that Fairfax County develop a community-wide climate and energy action plan (CECAP) to reduce GHG emissions by 2% annually, reaching carbon neutrality by 2050. The County Executive’s FY20 Advertised Budget Plan includes funding for a proposed Office of Environmental and Energy Coordination (OEEC), but the budget fails to provide for staff or a budget to undertake the recommended CECAP. As Chairman, I would propose funding the recommended CECAP that will establish specific goals and metrics to move Fairfax County to 100% clean, renewable energy by 2050. The effects of climate change are real and we must create 21st century solutions to protect our environment, our infrastructure, and our residents for generations to come. Q: What are the top three transportation priorities you have for Fairfax County? Tell us why and the revenue source (including any new revenue sources you’d champion). Jeff McKay: My Top Three: (1) Embark Richmond Highway, (2) Phase II of the Silver Line, and (3) Fairfax County Parkway. All revenue sources should be utilized, including local, state, and federal dollars. I am always open to any new revenue, but my experience has been that the County is very good at braiding funds from every source to achieve success. Tim Chapman: Our county’s residents have two primary desires in moving around the county 1) that they are not unnecessarily delayed by congestion and incidents and 2) that the trips they make are reliable in the same duration so that they have a consistent expectation of how long it takes to get somewhere. 3.) Champion the above question; work to improve our local communities walkability. Fairfax county should be focused on making businesses more accessible and to do this Fairfax county should work on how individuals journey to these small businesses. On the revenue funding for transportation, nothing is off the table. The funding analysis of the Fairfax Transportation Department is bleak. According to the Board’s funding analysis, Fairfax County does not have any new revenue for new projects. The Fairfax Board of Supervisors need to make meaningful improvements in how we fund our infrastructure. For more me delay, the more costly repairs and improvements will be. - Where the County is looking at neighborhood street design (beyond sidewalk and trail projects) to reduce impervious cover and creating green spaces can qualify for stormwater management funding and will help the county further address the 2020 and 2028 VA DEQ MS4 requirements With a focus on Vision Zero and systemic safety, there are target grants in these areas. Ryan McElveen: 1) Expanding Metro’s orange and blue lines. As someone who rides Metro to work, I know how critical an affordable, strong, safe, and sustainable Metro network is for all of our residents and particularly for our commuters. The Route 66 and Route 1 corridors are in desperate need of relief, and the widening of highways and addition of tolling to highways will only get us so far. A forward-looking, transit-based solution is necessary to reduce the number of cars on our major transportation arteries as our communities continue to grow. The District of Columbia, Maryland, Virginia and the federal government need to continue working to develop a long-term funding plan that prioritizes transit and Metro, in particular. 2) Maintaining our roads, expanding our sidewalks and bicycle lanes, and reducing space dedicated to parking lots. As we look to expand alternative transit options, the maintenance of our roads remains a top priority for our local community members. With climate change and changing weather patterns, the potential for more potholes, sinkholes, and cracks in our roads increases along with the demands on our transportation professionals. We simultaneously need to expand our networks of sidewalks and bicycle lanes and work with developers to reduce the amount of land dedicated to parking lots. While the transportation funding package that was passed at the state level was a good start to funding these priorities, we need to continue to look to our local and state governments to prioritize the funding of these improvements. 3) Building infrastructure to accommodate electric and autonomous vehicles. The transportation networks of the future will look very different from those of today, and our County needs to develop a transportation task force to plan for that future. For electric vehicles, we will need more charging stations, and for autonomous vehicles, we will need to work with car manufacturers and tech companies to map and prepare our road network. Alicia Plerhoples: My three transportation priorities for Fairfax County are (1) to make Fairfax County the premiere U.S. hub for autonomous, connected vehicles to reduce traffic congestion, greenhouse gas emissions, and traffic fatalities; (2) to solve Fairfax County’s “first-mile / “last-mile” transportation problem to increase metro and bus ridership, reduce traffic congestion, greenhouse gas emissions; and (3) to focus on transit-oriented development and new transit links in Fairfax County’s aging commercial corridors. There are already more than 70 miles of smart roads in Fairfax County with sensors installed along I-66, I-495, I-95, Route 29, and Route 50 to form the connected and automated corridor. Autonomous vehicles are being tested along this corridor and elsewhere, including in Reston. Connected autonomous vehicles can reduce traffic congestion and traffic fatalities which are caused by human error. Autonomous vehicles are also often fully electric and therefore reduce greenhouse gas emissions. I would submit transportation proposals to the VDOT and Northern Virginia Transportation Authority to fund additional infrastructure to make Fairfax County’s connected autonomous corridor fully operational within a realistic timeframe and to also expand the corridor. The NVTA projects within Fairfax County currently focus on widening various highways, which encourages more drivers on the road – while we are expanding highways, we need to encourage connected, autonomous vehicles rather than human-driven, gasoline cars. I would also prioritize dedicated bus lanes (bus rapid transit) along our most heavily trafficked highways. To encourage public transit use, we also need to solve the “first-mile / last-mile” problem. Most people are only comfortable walking less than a quarter mile to or from public transit. Autonomous cars can help with the “first-mile / last-mile” (FM/LM) problem that discourages residents from taking public transit. In addition to autonomous cars, I would incentivize private-public partnerships to increase bike shares near transit, autonomous cars, shared ride services, and door-to-metro smartphone apps. Finally, the best way to manage traffic while also preserving open space in Fairfax County is to focus new transit-oriented development in its aging commercial corridors and adding new transit links. Pedestrian-friendly Mosaic District is an example of a mixed-use development project that needed more thought around transportation, particularly transportation between the Dunn Loring / Merrifield metro and Mosaic (another “first-mile / last-mile” problem). Any mixed-used developments that are pedestrian-friendly also need transit or pedestrian-friendly paths to and from the developments, including shuttles. I would work to create more Commercial Revitalization Areas around Fairfax County reliant on Tax Increment Financing. Q: Fairfax County is one of the few area jurisdictions that has not adopted Vision Zero. Given the high number of people who die or are seriously injured while moving around in Fairfax, what would you advocate to ensure safety for everyone even though Fairfax DOT has to work with VDOT to make changes in Fairfax’s transportation network? Jeff McKay: I have made it a goal of mine to make transportation and infrastructure improvements to protect those moving around Fairfax County. This includes road diets, lane diets, missing sidewalk links, pedestrian refuges, crosswalk additions, signal head installations, and more. It also includes implementing the County’s first-ever High-Intensity Activated CrossWalk (HAWK) signal in Lee District to increase pedestrian safety near Lynbrook Elementary School. I think we’ve been tremendously successful with those efforts, but also recognize we must do more. I was pleased to recently sit on a panel at the Washington Region Vision Zero Summit to discuss the County’s successes. We also spoke about the recognition that there is still much to do to make all forms of transportation safe for everyone. The Vision Zero Network does important work with this, as well. As you know, it is the state (via the Department of Transportation), that owns and maintains a majority of the roads in Fairfax County, which creates a gray area around the adoption of policies such as this. As Chairman, I would welcome the adoption of Vision Zero and hope that VDOT joins that signing with us as well. - That uses systemic approach to safety which involves implementing improvements linked to high-risk roadway characteristics and specific crash types of different severity. This would allow the county expand traffic safety implementation at little extra cost, especially if linked to other project locations with like high-risk issues. Ryan McElveen: Driving-related fatalities remain the top cause of non-disease related death around the world with nearly 1.3 million people dying in road crashes each year. With the number of cars that travel through the 500 square miles of Fairfax each day, adopting Vision Zero must be a priority for our county. As we move to a transportation network that accommodates autonomous vehicles, we will need to focus even more on driver training and public safety. There are many things that can be done to improve road safety in Fairfax, from creating public relations campaigns about road sharing and safety, speed limits, street crossings, bicycle lanes, and school bus passing to expanding our network of sidewalks, winko-matics and bicycle-accessible roadways. Alicia Plerhoples: In 2017, Fairfax County had over 13,000 crashes resulting in over 6,000 injuries and 35 traffic fatalities. Fairfax County needs to do more to reduce traffic-related fatalities and injuries, and as a result, traffic tie-ups will be lower. I support adopting strategies developed by Vision Zero. Vision Zero starts with the ethical belief that everyone has the right to move safely in their communities, and that system designers and policy makers share the responsibility to ensure safe systems for travel. The Vision Zero approach recognizes that people will sometimes make mistakes, so the road system and related policies should be designed to ensure those inevitable mistakes do not result in severe injuries or fatalities. Enacting Vision Zero strategies means working closely with VDOT, the Fairfax County Police, the Fairfax County Public Schools, and community members to create an equitable, collaborative, data-driven action plan. While I support adopting Vision Zero, I would also want to make sure that the One Fairfax equity lens is integrated into the implementation of Vision Zero. Solutions for traffic fatalities such as speed cameras and increased speeding enforcement is likely to disproportionality impact low-income communities and communities of color. Such an impact would need to be addressed and mitigated before and during implementation of Vision Zero.